2. The DVD video you watched on your TV or DVD player is scrambled and the sound quality is very poor. 3. 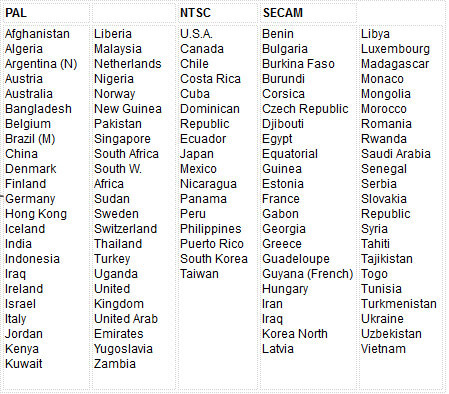 Your DVD player can’t play the NTSC formatted DVD you brought or purchased from overseas. Depending on where you live, DVD formats differ from each country. Generally speaking, a DVD disc released in a country which adopts NTSC television system couldn’t be recognized and played back by DVD player where the country adopts PAL television system. Unless the DVD disc is region free, most DVD players could only play back DVD discs released with the same television system. This post would introduce detailed information about NTSC and PAL, ways to play back NTSC and PAL DVD discs, and solutions to convert NTSC to PAL DVD and create PAL DVD disc out of videos. Although the differences of PAL and NTSC are small, there are big inconveniences for DVD discs. The movies or videos can be stored on DVD in one of two resolutions: 720 x 576 pixels (PAL DVDs), or 720 x 480 pixels (NTSC DVDs), and with various frame rates like 24, 25, and 30 fps. The DVD player reads the data on DVD disc and formats it appropriately to present on either PAL or NTSC TV set. PAL DVDs have a compelling advantage over NTSC DVDs because PAL DVD has larger pixels of resolution (720×576 vs 720×480). NTSC is the color encoding system used by DVD players and until recently by broadcast television in North America, Japan, and most of South America. PAL is the color encoding system used by DVD players and broadcast television in Europe, most of Asia and Oceania, most of Africa, and parts of South America. 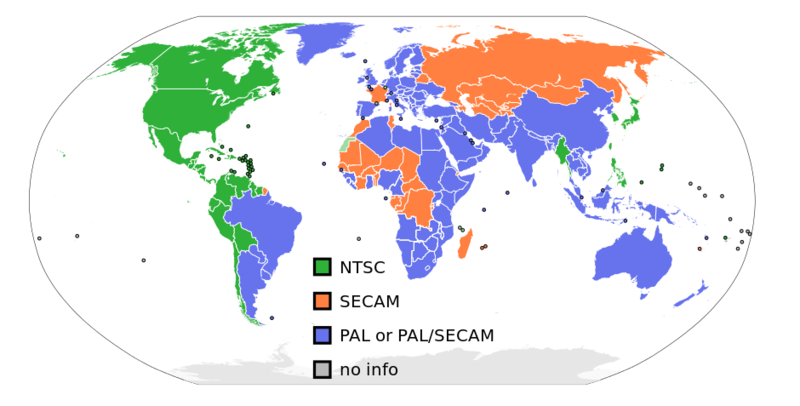 The below picture lists the countries using PAL, NTSC and SECAM. You could take it as referrence if you want to buy a DVD disc. Recently, region-free DVD player or DVD disc has been greatly popular among the world. Region free DVD player could read and play back any NTSC/PAL DVD disc, while region-free DVD disc could be played back by most DVD players in different countries. If you don’t get a region-free DVD player or region free DVD disc, you then need to convert NTSC DVD to PAL DVD or PAL DVD to NTSC DVD for smooth playback. You could refer to the below content for detailed solutions to play back NTSC/PAL DVD disc and convert NTSC DVD to PAL DVD (and vice versa). A region-free DVD player could help you play back DVD discs of both NTSC and PAL television systems. You could find a lot of wonderful DVD players to play back DVD discs on your computer. Generally speaking, hardware DVD players are rare to be region free. 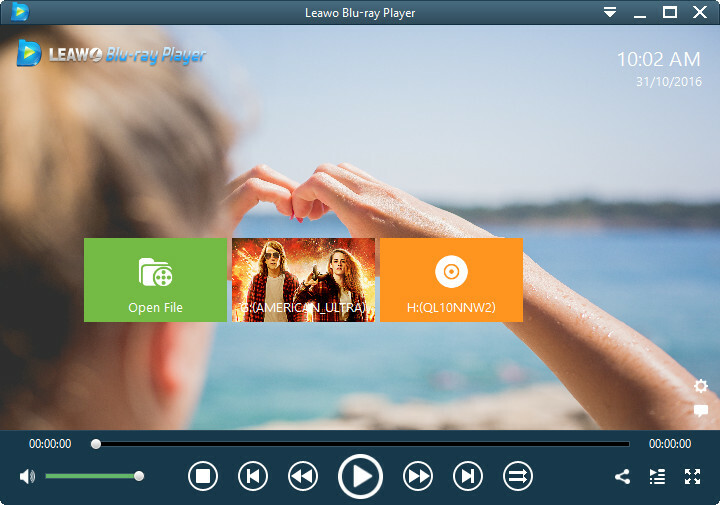 However, you could find some software online, just like Leawo Blu-ray Player, a region-free Blu-ray player software program that could play back any Blu-ray/DVD disc regardless of the disc region code restriction, protection and television systems. This region-free DVD player is quite easy to use: launch it, open the disc drive to play back inserted DVD disc. It provides comprehensive playback control and easy navigation for you. Another solution to play NTSC DVD on DVD players of PAL television system is to convert NTSC DVD to PAL format by using NTSC to PAL converter software. Most DVD copy software could carry out this task smoothly. Leawo Blu-ray Copy is the most popular NTSC to PAL converter software to convert NTSC to PAL format in a few simple clicks. 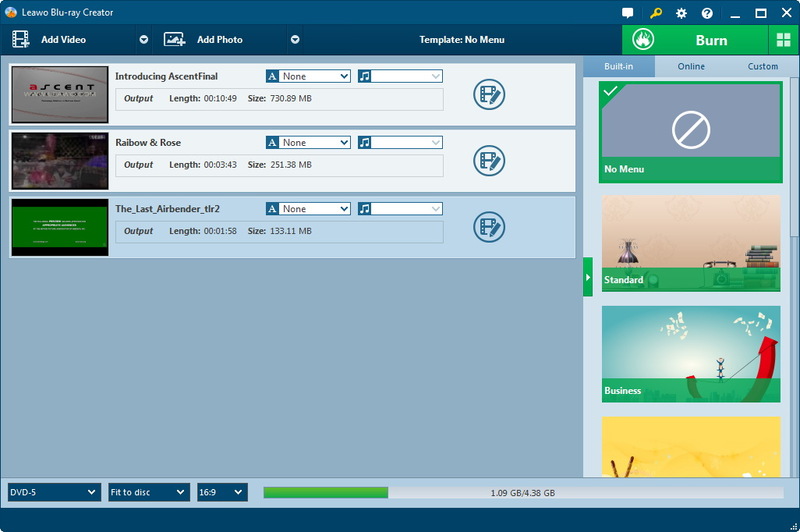 It is a professional Blu-ray copy software program that could copy and backup Blu-ray/DVD content onto computer hard drive or blank disc without quality loss. Acting as a NTSC to PAL converter software program, Leawo Blu-ray Copy easily converts NTSC DVD to PAL format without changing or losing any other elements in source DVD content. With Leawo Blu-ray Copy, you could freely convert NTSC to PAL, or convert PAL DVD to NTSC format. 1. Kick off Leawo Blu-ray Copy. Click the wheel icon on the top-right and then open the "Copy&Burn" option. Under the "Default video mode" drop-down box, choose PAL (If you want to convert PAL DVD to NTSC, choose NTSC). 2. Insert source NTSC DVD disc into the DVD recorder drive, then click "Add Blu-ray/DVD" button to add NTSC DVD disc into this program. Choose "Full Movie" mode at the bottom-left corner and set output disc type. 3. Click the big green "Copy" button. Set "Copy to", "Disc Label" and "Save to" options. Insert target blank DVD disc into the other DVD recorder drive and thne select it as target under "Copy to" option. 4. Finally, click the "Copy" button to start converting NTSC DVD to PAL DVD within this DVD Copy software. 1. The above steps are applicable to people who have 2 DVD recorder drives. If you only have one DVD recorder drive, you could firstly copy NTSC DVD disc into PAL DVD ISO image file by selecting "ISO File" option in Step 3. Then you could copy the PAL ISO image file onto an a blank writable DVD disc with Leawo Blu-ray Copy as well (see detailed steps below). 2. If you want to copy the main movie only from NTSC DVD to PAL DVD disc, choose "Main Movie" mode in Step 2. 3. In Step 2, set the output disc type (at the bottom left corner) according to the target DVD disc. If you happen to get an NTSC DVD ISO image file and want to burn it to PAL DVD disc, or if you only have one DVD recorder drive, the below steps would be helpful. It shows how to copy NTSC DVD disc/ISO image file to PAL DVD disc with one drive. This section is a complement and perfection to the above guide. 5. Insert a blank writable DVD disc into the DVD disc recorder drive. 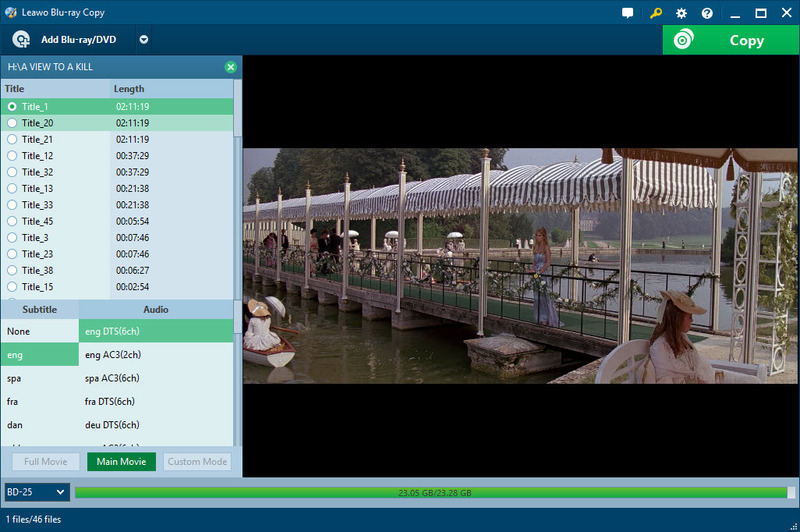 Drag and drop your PAL/NTSC DVD ISO image file into Leawo Blu-ray Copy. 6. On the popup "Add iso file" interface, set "Copy to" and "Disc Label" options. Set the DVD recorder drive as target under "Copy to" option. 7. Click the "Burn" button on the "Add iso file" interface to start copying NTSC/PAL DVD ISO image file to PAL DVD disc. 1. Make sure you have set the output DVD video mode as "PAL" (mentioned in Step 1). 2. Blank DVD discs are neither NTSC nor PAL formatted. So you could just insert a blank writable DVD disc into the DVD recorder drive for NTSC to PAL conversion. If you happen to plan burning video to PAL or NTSC DVD disc for a friend aboard, like burning a video in USA to DVD disc for an England friend, you need to pay attention to the television system as well. Different television standards would result in playback error. 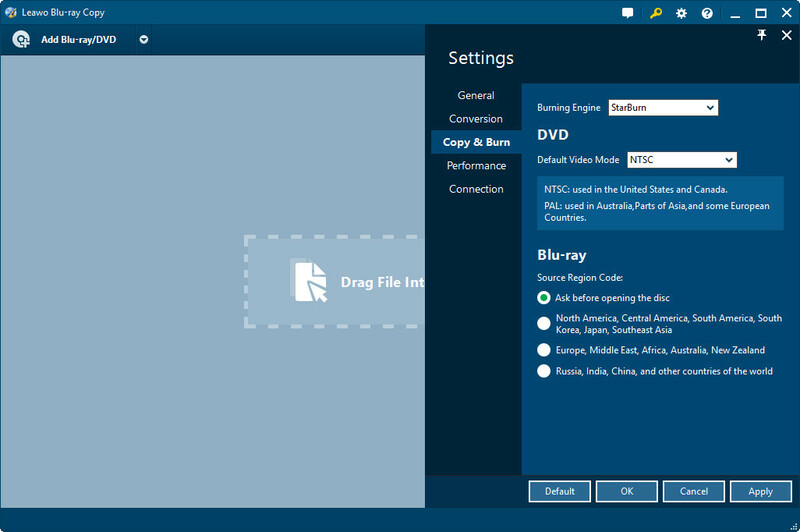 You could take use of Leawo Blu-ray Creator to burn video to PAL/NTSC DVD disc for DVD players of different countries. 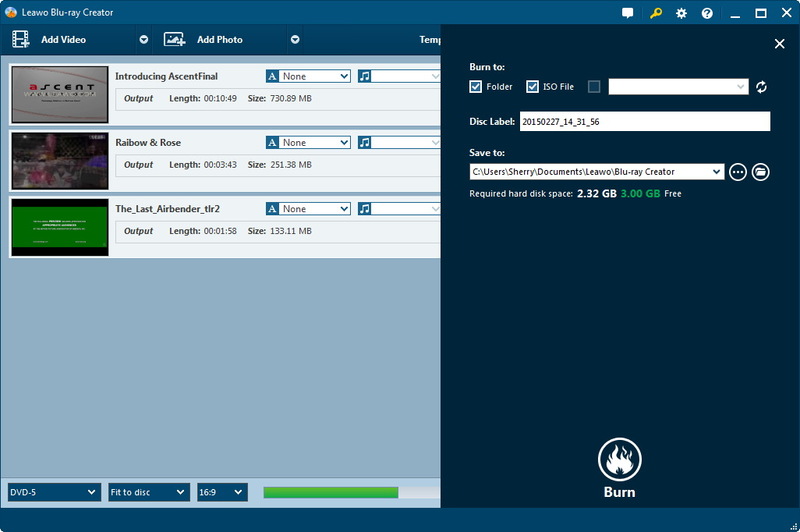 Leawo Blu-ray Creator could perform as a professional DVD burner to help you convert and burn video to PAL or NTSC DVD disc easily. 1. 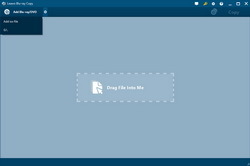 Drag source video into this DVD creator. Insert a blank writable DVD disc into DVD recorder drive. Set disc type (according to the disc inserted to the drive), quality and aspect ratio at the bottom. 2. Click the wheel icon on the top right corner and then navigate to the "Burn" option. Select DVD mode from PAL and NTSC under the "Default Video Mode" option. 3. On the main interface, select a disc menu on the right sidebar and then click the middle to preview and edit selected disc menu. You could get more disc menu templates via downloading. 4. Click the big green "Burn" button to set "Burn to", "Disc Label" and "Save to" options. After these, click the bottom "Burn" button to start burning video to PAL/NTSC DVD. To burn video to PAL/NTSC DVD disc, insert a blank writable DVD disc into the recorder drive first, set output disc type according to the inserted disc at the bottom in Step 1, set the inserted disc as target under "Burn to" option in Step 4. 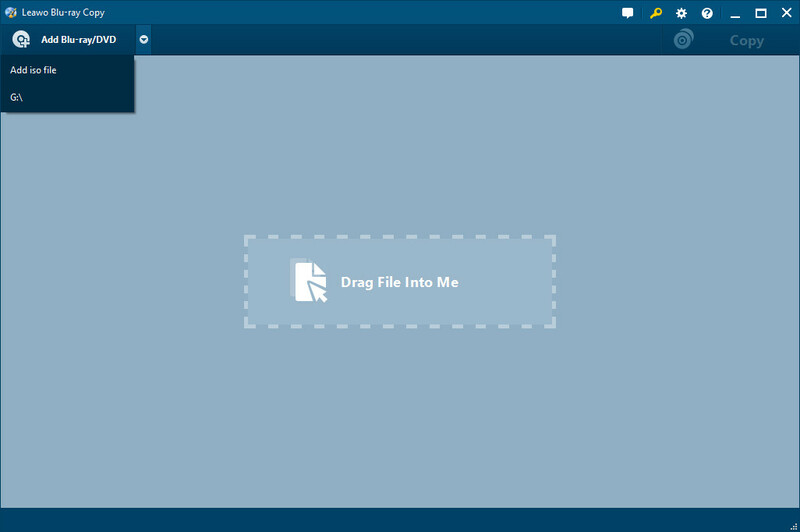 In Step 3, you could rename titles, adjust the title position and content, text font, size and color, load background image/video/audio, edit the content on chapter list pages, etc.